Are you ready to return to the glam metal era of the 80s?? 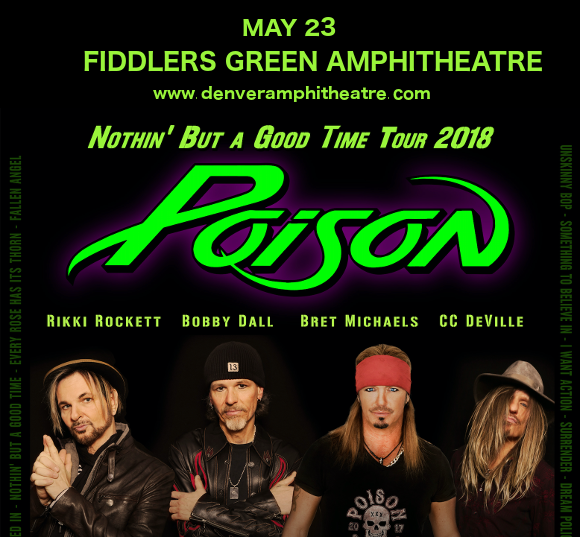 That’s right, POISON are back, on a massive North American tour with long-standing friends and tour buddies Cheap Trick!! Anticipation is high at the Fiddlers Green Amphitheatre in preparation for this awesome show on Wednesday 23rd May 2018 – be there! Hit the “Buy Tickets,” button to get your place at the show NOW!! Comprised of band members Bret Michaels, Rikki Rockett, Bobby Dall, and C.C. DeVille, Poison were one of the most successful bands of their genre through the 80s and mid-90s. Their debut album, “Look What the Cat Dragged In," was a phenomenal commercial success, achieving 3x multi-platinum status by 1990. This trend was set to continue, as “Open Up and Say… Ahh!" became their best-selling album of all time, becoming certified Platinum no less than an astonishing five times!! 30 years on, and the band are still recording, releasing new material and touring. What are you waiting for?? Get your Poison tickets now and get ready to be a part of it all!